Biography: OTCHOUMOU Kraidy Athanase is a nutritionist biochemist, practicing as a teacher-researcher at the University Felix Houphouet Boigny of Abidjan in Côte d’Ivoire since 2013. He was born on September 12, 1975 in Abidjan, Côte d’Ivoire. He is passionate about nature. 1. M.F.R.L. WOGNIN A. K. OTCHOUMOU, F.K. YAO, Sébastien L. NIAMKE (2018). Effect of mixing two leafy vegetables on the quality of rabbit meat. European Journal of Biotechnology and Bioscience, 6(6): 30-36. 2. K. OTCHOUMOU, M.F.R.L. WOGNIN L.T. ZOUE, F.K. YAO, S.L. NIAMKE (2018). Amino acids and fatty acids composition of Abelmoschus esculentus, Vigna unguiculata, Corchorus olitorius, Ipomea batatas, Solanum melongena sold on the syporex market of yopougon (Côte d’Ivoire). International Journal of Research, 6(11): 315-322. 4. M.G.YEO, C.M BLE, A.K. OTCHOUMOU, S. DABONNE, Y.L. ALLA, A.O. ETCHIAN (2017). Digestibility and growth performance in fingerlings of tilapia Oreochromis niloticus fed with diet containing high-carbohydrate ingredients. International Journal of Fisheries and Aquatic Studies, 5(4): 171-175. 5. M.G. YEO, C.M BLE, S. DABONNE, Y.L. ALLA, A.K. OTCHOUMOU, A.O. ETCHIAN (2017). Effect of dietary gelatinized starch on growth performance, feed utilization and body composition of Nile tilapia (Oreochromis niloticus L.), International Journal of Food Science and Nutrition, 2(4): 125-129. 6. P.M.M. ANVO, R. SISSAO, R.D.B. ABOUA, C.Y. ZOUNGRANA-KABORE, A.K. OTCHOUMOU, P.E. KOUAMELAN, A. TOGUYENI (2017). Preliminary use of cashew kernel oil in Clarias gariepinus fingerlings diet: comparison with fish oil and palm oil. International Aquatic Research, 9(2):129-139. 7. P. M. M. ANVO, A. TOGUYENI, A.K. OTCHOUMOU, C.Y. ZOUNGRANA-KABORE, P.E. KOUAMELAN (2016). Evaluation of Cirina butyrospermi caterpillar’s meal as an alternative protein source in Clarias gariepinus (Burchell, 1822) larvae feeding. International Journal of Fisheries and Aquatic Studies; 4(6): 88-94. 8. F.K. YAO, A. K. OTCHOUMOU, M.F.R.L. WOGNIN, S.L. NIAMKE (2016). Traditional leafy vegetables combinations enhance growth performance and improve health status of New Nealand White x Californian rabbits. Food and Environment Safety - Journal of Faculty of Food Engineering, ?tefan cel Mare University – Suceava, 3: 240 – 248. 9. P. M. M. ANVO, A. TOGUYENI, A.K. OTCHOUMOU, C.Y. ZOUNGRANA-KABORE, P.E. KOUAMELAN (2016). Nutritional qualities of edible caterpillars Cirina butyrospermi in southwestern of Burkina Faso. 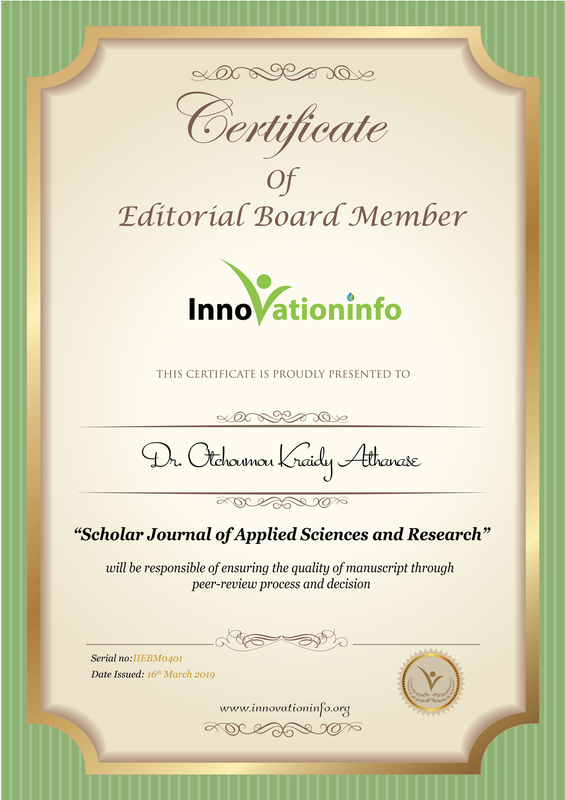 International Journal of Innovation and Applied Studies, 18(2): 639-645. 10. F.K. YAO, A. K. OTCHOUMOU, M.F.R.L. WOGNIN, A.K. KONAN, S.L. NIAMKE (2016). Growth Parameters, Protein Digestibility and Health Status of Rabbit Oryctolagus cuniculus Fed with Palatable Leafy Vegetables. European Scientific Journal, 12(27): 191-207. 11. F.K. YAO, A. K. OTCHOUMOU, M.F.R.L. WOGNIN, S.L. NIAMKE (2015) Effect of Combination of Leafy Vegetables on Growth Performances of Rabbit Oryctolagus cuniculus. Journal of Animal Science Advances, 5(12): 1522-153. 12. P. D. OULAI, L.T. ZOUE, A. K. OTCHOUMOU, S. L. NIAMKE (2014). Study of roasting effect on nutritive and antioxidant properties of leafy vegetables consumed in northern Côte d’Ivoire. Food and Environment Safety - Journal of Faculty of Food Engineering, ?tefan cel Mare University – Suceava 13(3) : 252-262. 13. A.K. OTCHOUMOU, C.M. BLÉ, Y.L. ALLA, G. CORRAZE, S.L. NIAMKÉ, J.K. DIOPOH (2014). Effect of Crude Palm Oil Incorporation on Growth, Survival, Feed Efficiency, and Body Composition of Heterobranchus longifilis Fingerlings. Journal of Applied Aquaculture, 26:169–178. 14. K. OTCHOUMOU, C. M. BLE, Y. L. ALLA, A. A. ADINGRA, G. CORRAZE, S. NIAMKE, J. K. DIOPOH. (2012). Apparent protein and energy digestibility of selected carbohydrate-rich feed ingredients for african catfish Heterobranchus longifilis (valenciennes, 1840). Agronomie Africaine 24 (1): 49 – 58. 15. K. OTCHOUMOU, C. M. BLÉ, O. A. ETCHIAN, Y. L. ALLA, S. L. NIAMKÉ, J. K. DIOPOH. (2012). Effects of increasing dietary protein levels on growth, feed utilization and body composition of Heterobranchus longifilis (Valenciennes, 1840) fingerlings. African Journal of Biotechnology, 11(2): 524-529. 16. K. OTCHOUMOU, C. M. BLÉ, S. L. NIAMKÉ, G. CORRAZE, F. KERVAREC, Y. L. ALLA, J. K. DIOPOH (2011). Effect of Dietary Carbohydrate: Lipid Ratio on Growth Performance and Body Composition of African Catfish (Heterobranchus longifilis) Fingerlings. The Israeli Journal of Aquaculture - Bamidgeh, IIC:63:663-669. 17. R. KOUMI, B. C. ATSÉ, K. A. OTCHOUMOU, P. KOUAMÉ (2008). Effects of partial and complete replacement of fish meal protein with a soya protein on growth performance of black-chinned tilapia Sarotherodon melanotheron (Rüppell 1852) in tank culture. Livestock Research for Rural Development, 20 (12).